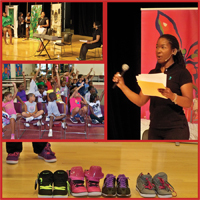 "Chase Your Dreams Wearing Sneakers: The Anti-Bullying Musical & Workshop" created and performed by Christina Dzenyuy, is an educational one-woman youth motivational, anti-bullying theatrical presentation and workshop with inspiring music, powerful movement and a positive message. In the show, the main character, “Chrissy,” is a 14-year-old high school student whose fear is stopping her from pursuing her goals. However, “Chrissy’s” mother, grandfather, neighborhood friend and a magical shoemaker help transform “Chrissy” into an inspired, prepared, confident, persistent and fearless teenager who ultimately chases her dreams wearing sneakers! “Chase Your Dreams Wearing Sneakers: The Anti-Bullying Musical” is an anti-bullying program for students in grades 4-12 and is presented in schools, after-school programs and festivals in New York and Connecticut. The musical is accompanied with a workshop, that aligns with several Common Core State Standards for English and Theatre Arts at each grade level. For more information about “Chase Your Dreams Wearing Sneakers: The Anti-Bullying Musical,” visit www.WeChaseDreams.com today! "Chase Your Dreams Wearing Sneakers: Anti-Bullying Musical & Workshop"
Total Execution Time: 0.6 sec.